Upward writing slate allows Braille to be written from left to right. Built-in roller makes writing multiple lines quick and easy. Slate has a 32 cell capacity. Fits many different sizes of paper. Product is lightweight, compact, and portable. Includes a hollow-tipped stylus and a plastic eraser. A revolutionary new product that makes writing Braille with a slate a snap. Measures about 10-1/2 in by 2-1/2 in by 1 in. Package Weight: about 7.8 ounces. Our Read-and-Write Braille Slate is a breakthrough in note-taking for the blind. Simply roll your paper into the device, write your message from left to right, and roll out the paper when you're done. This one slate can write on materials as small as labeling tape to as large as a full sheet of A4 paper. Finally, your Braille slate is affordable, versatile, portable, and easy! Produce notes or letters quickly and easily using our new compact and portable Read-and-Write Slate. This lightweight braille writing frame is unique in that the paper can be fed into it just like a Brailling machine, such as the Perkins Brailler. It can be used with many sizes of paper up to A4 size, and can also be used with Braille Labeling Tape. (Letter-size paper fits fine if a small edge is trimmed off one side of the page first). So how does it work? Well, this is an upward writing slate, which uses a unique hollow-tipped stylus to produce the dots. Yes, that's right - Braille is written from left to right, so you don't have to worry about reversing characters as you write or having to turn the paper over to read what you have written! The slate has a 32 cell capacity, which makes it ideal for letter writing, labelling and note taking. It allows you to check each line of braille produced by simply rolling the paper ahead one line, which moves your new line of Braille to the reading tray. Each line space is easily recognized by a reassuring click and noticeable stop action, so lines are always properly spaced. Directions for the Read-and-Write Slate From Future Aids, The Braille Superstore. 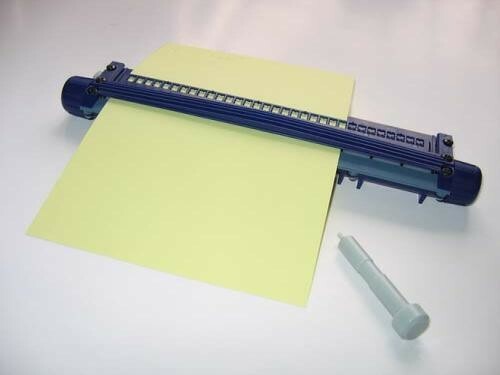 This Roller Frame is a low cost braille writing frame featuring a paper feeding system. It is designed to produce notes, labels or letters quickly wherever you are, as it is compact, light and portable. The Roller Frame is capable of producing 32 Cells of braille on paper, plastic or labelling material up to the width of A4 in portrait orientation (210mm x 297mm). As such, it easily accommodates Letter-size paper if a small edge is cut off the side. One stylus and one eraser is located within the Roller Frame for simple and safe storage. Braille dots are produced using one of these unique hollow-tipped styluses. Braille is written from left to right, saving the need to reverse braille characters and write from right to left as with traditional braille writing slates. Neither is it necessary to turn the paper over to read what has been written! Place the Roller Frame on a surface, so that the series of ridges runs across the top of the frame from left to right. These ridges need to be closest to you when the frame is correctly orientated. It is recommended that the roller frame is used on a desk or table, and the rubber feet underneath should reduce movement. At each end of the Roller Frame beyond the ridged area, you will find a feeder knob identified by raised lines running around its circumference. Located in slots just behind each feeder knob is a stylus. The styluses appear to be loose in the slots, but this is a feature designed to enable the styluses to be removed easily, and they should not fall out by mistake. The series of ridges that run across the frame provide strength and support when writing braille, and guide the user to the feeder knobs. Just behind these ridges, you will find the cell location indicators, which are a row of small, raised triangular shapes that run along the length of the Roller Frame. The cell location indicators guide the user to the center of each braille cell. Behind the cell location indicators is the writing guide. This is where the braille is embossed on to the writing or labelling material. The writing guide is best explored with a stylus, as this provides the best feedback and location information to you. On the top of the writing guide, at the edge facing away from you, there is a series of indicator pips that advise the user of the cell positions. These are marked at cells 5, 10, 15, 20, 25 and 30. Run your fingers outwards toward the feeder knobs along the writing guide. At each end of the writing guide, you can feel a depression and a slot that runs underneath the writing guide. This is the slot for locating and guiding labeling tape should you wish to use it with the Roller Frame. Please see the section titled "Using labeling Tape" for more information. A reading ledge has been designed into the Roller Frame which enables the user to check their work. This reading ledge is located behind the writing guide, and it sits at a lower level than the writing guide. Place the Roller Frame in front of you. Then, position a piece of paper, plastic or labelling material on the flat surface in front of the ridges nearest you, gently pushing it into the roller frame until you feel resistance. Try to ensure that the writing material is as straight as possible. Gently secure the writing material in position with one hand, turning one feeder knob away from you until the material is secured; now use both hands to turn the feeder knobs away from you until the material just overhangs the reading ledge at the back of the roller frame. You may like to roll back one click towards you to make maximum use of the writing material, which is now ready to be written on. If the writing material fails to feed into the roller frame or you feel some resistance, stop and check that the writing material is correctly aligned. It may require several attempts to feed the paper or other material into the Roller Frame before you are familiar with the technique. During the paper feeding process you should feel the feeder knobs start to resist or even stop turning, you may also hear a click at this point as well. This is the line spacing feature of the product. The line spacing feature of the Roller Frame is designed to move the paper forward or backwards the set distance for close-line braille writing. The distance is around one centimeter from the previous line, and you will need to move up or down by two clicks for double line spacing. During the paper feeding process, please observe the feeling of the feeder knobs stopping or a click sound being heard. This is an accurate indication that a new line position has been reached. The line space function closely matches the Marburg Medium specification for braille layout, but does depend on other factors, such as the thickness of the material being used and accuracy during the paper feeding process. If the writing material is a little crooked as it emerges from the back of the Roller Frame you can realign the paper with a combination of rotating the feeder knobs and pulling gently on one side of the paper. Aligning the writing material will become easier with experience. You are ready to start writing once you can feel that a new line position has been reached and the writing material is emerging beyond the writing guide. Remove a stylus from the Roller Frame body by sliding it out sideways and, holding the stylus, locate the cell you wish to start at. Insert the stylus into the cell grid and explore the way in which the stylus latches into the standard braille six-cell pattern. You can feel each dot of the cell as a raised notch or as an indent in the sides of the cell, and these indicate the cell grid. Once you have familiarized yourself with the grid, you are ready to emboss braille onto the writing material. Use the stylus to create the dots you want by pushing down on it vertically. It is not necessary to use great pressure unless the writing material is very thick, in which case significant pressure may need to be applied with the stylus in order to create a dot accurately. You may hear a slight click or feel a resistance when a dot is formed, and with practice it will become easier to write correctly with the roller frame. Although using the stylus is relatively easy, making good quality dots is very much dependent on the type of material being used in the Roller Frame. It is important to keep the stylus vertical to ensure it pushes the paper down correctly onto the pins that form each dot. Once you have finished a line of braille, rotate the feed knobs away from you until you hear or feel a click. The paper has reached a new line position so you can continue writing on the next line. At this point you can check your work by reading the braille you have just created using the reading ledge. If the braille is too weak or you need to correct or add some braille, simply turn the feed knobs towards you until you hear a click. This indicates that the previous line space position has been reached. You can now go over your work or add additional dots accordingly. The Roller Frame will feel stiffer in use when tested without paper. Please avoid turning the feed knobs without paper for long periods as this may damage or wear out some of the internal parts. With the Roller Frame positioned in front of you and without any paper inserted, unroll a length of labeling tape. Locate the depressions and slot at each end of the writing guide. Position the labeling tape (sticky side down) at the left side of the reading ledge and slip it underneath the writing guide. The tape should protrude out of the slot at the left end of the writing guide. Once the left end of the tape is positioned correctly, hold this in place while locating the other depression and pushing the tape into this slot. Make sure the tape is actually underneath the writing guide by running your fingers along the guide plate to establish that the tape appears straight and is running correctly. It is possible to feed the tape into both slots at the same time, but this does require some gentle maneuvering of the tape. Once the tape is fitted correctly, draw it gently to the right until only a small piece is sticking out from the left end of the writing guide, as this will save wastage. Once the tape is correctly positioned, you can start writing braille on it in the normal way. Please note that some additional pressure may be required with the stylus to produce an accurate dot when using labeling tape. For best results it is recommended that you constantly check that the tape is in position while creating your braille message or label. If you wish to write a long message or several labels on the tape, simply pull the tape along from the left once a line is complete, making sure it is not dislodged from the slot. Once you feel the last character you brailled emerging, you are ready to start writing again, and can continue for as long as you like, or until the reel of labeling tape is used up! This Roller Frame is a compact, low cost, upward writing braille frame featuring a paper feeding system to quickly produce notes, labels or letters. Small and light enough to carry with you, the Roller Frame is capable of producing 32 Cells of braille on paper up to and including the A4 format (210mm wide). Writing material does not feed into product. Stylus or Braille plate may be worn out. Guide Plate and Braille Plate may be mis-aligned. Warning: Prolonged use of the frame may lead to tiredness in the wrist and hand so please take regular breaks when using the Roller Frame for long periods.